AVANTASIA NOMINATED FOR METAL HAMMER AWARDS! Tobias and AVANTASIA have just been nominated for a METAL HAMMER AWARD in three different categories: 'Best album' (Ghostlights), 'Best German Band' and 'Metal anthem' (Mystery Of A Blood Red Rose). The winners will be announced on the 16th of September, until then AVANTASIA are going to play four final shows in Spain, Belgium, Germany and Poland. The most successful AVANTASIA tour ever with countless sold out shows around the globe is heading towards the end. If you wanna see some of the final GHOSTLIGHTS Shows you have to come to one of the final festivals AVANTASIA is going to headline. The last show in Germany will take place August 26th and will be a very special event: AVANTASIA will perform at the medieval abbey "Kloster Schiffenberg“ in Giessen in a breathtaking historical environment. NEW VIDEO CLIP & SINGLE: "DRACONIAN LOVE"
Tobias explains the choice of "Draconian Love" as the second single: "It was a logical next single, the song isn't really mainstream, yet it's extremely catchy." Also the fans helped in making the decision: "We've been touring for weeks and we've played the song every night. From Tokyo to New York people went crazy, so I think the decision was made by the fans as well. And as we wanted to include them in the clip, we decided to shoot the video while on tour, performing it prior to our show in Sao Paulo, Brazil two weeks ago. 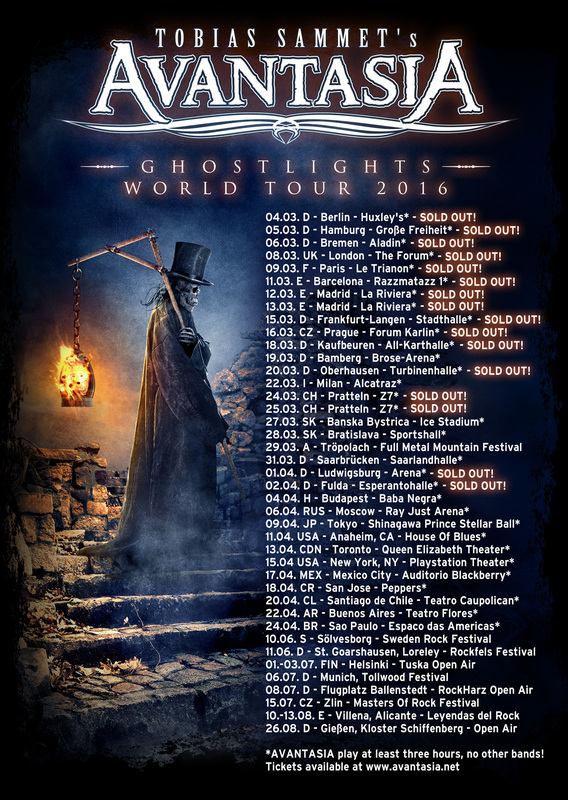 "The GHOSTLIGHTS WORLD TOUR has started early March and leads AVANTASIA to 24 countries in Europe, Russia, Japan, USA, Canada, Mexico, Costa Rica and South America. So far 24 out of 33 shows were completely sold out in advance. In the summer AVANTASIA will play headlining performances at the following European festivals, until they finish the tour at the historical Open Air stage at the Schiffenberg abbey near Giessen, Germany on August 26th! The new album "GHOSTLIGHTS" has entered the charts in 15 European countries as well as in the USA, Canada and Japan. It went into the Top10 album charts in 9 countries, in Germany "GHOSTLIGHTS" went in at #2. We'll keep you posted on forthcoming dates! LAST CHANCE TO CATCH THE SHOW IN GERMANY: BAMBERG & SAARBRÜCKEN! Today the last few of over 4,000 tickets for Arena in Ludwigsburg have been sold. This means if you want to see the 3hrs GHOSTLIGHTS show, Bamberg (tomorrow, Saturday) & Saarbrücken (31st) are your last chances. For Bamberg there will be enough tickets even if you just come to the box office, as the venue's capacity has now been extended to a total of approx. 7,000 people. NEUER VIDEOCLIP & SINGLE: "DRACONIAN LOVE"